The interview with psychiatrist Max Hamburger that appeared in the March 2012 Dutch magazine Aanspraak was translated into English for me by Hasso Castrup. 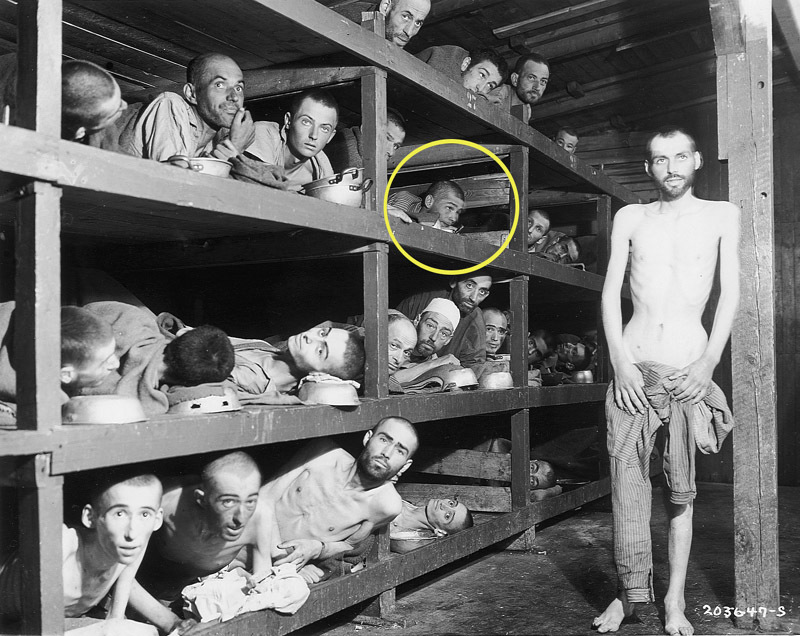 Some things that Hamburger said are revealing of his overall honesty when it comes to his statements about “the Holocaust.” Being a “holocaust survivor” who appears in the famous photograph is, after all, his only claim to fame. I’ve already reported in a previous article (scroll down to end) that his father was an Amsterdam diamond merchant, Hartog Hamburger, who died from a bizarre accident when Max was only four years old. His mother, a fashion designer, worked even harder after that and often left him with his grandparents. When Max was ten, his brother died of leukemia, leaving Max alone with his mother. This is quite a lot of trauma in the first ten years of life, which couldn’t help but leave a mark on his psyche. He says his brother’s death is what inspired him to study medicine, beginning in 1938 when he was 18. But in 1942, further public education was denied to him because he was Jewish. 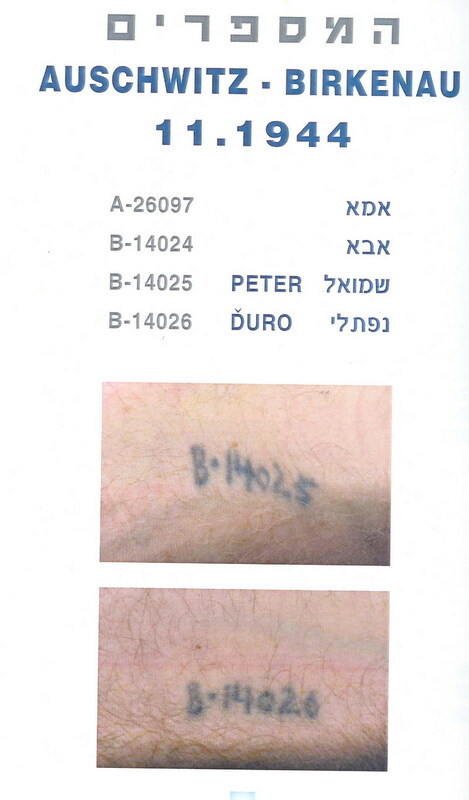 His job with the Jewish Council (Judenrat) allowed him to remain immune to deportation to Westerbork by getting a special stamp on his Ausweis (ID). In the summer of 1942, he went to work as an intern at the New Israelite Hospital, where he learned that when the substance ‘Pyrifer’ is injected intravenously it will cause high fever similar to what one gets with malaria or typhoid. Hamburger began injecting this into the Jewish patients so they would be declared unfit for deportation. This, of course, raised suspicion among the Germans and Hamburger says in June 1943 the New Israelite Hospital was raided, in order to be emptied. He and other medical personnel hid patients under laundry and in the morgue, and led seriously ill patients into hiding (?). He is proud to describe himself as part of the Resistance and says he was later awarded with a memorial cross because of it. He tells a story that describes how in August 1943 he once again escapes deportation, but I’m not repeating it because there is no way to assure it’s true. He then moved to the Jewish Handicapped (Asylum) at Weesperplein, where he and other doctors again tried to”save” as many patients as possible by declaring them ill with contagious diseases. He says at the Portuguese-Israelite Hospital people in mixed marriages were to be sterilized. Along with most of the staff, he refused to cooperate and went through a hidden door into a neighboring villa and went into hiding. He and his girlfriend were married by a rabbi; they were both fully into the Resistance now. His mother was also brought to where he was, but she quickly hid herself elsewhere. Since we know there were no gassings at Auschwitz – this is a dead giveaway that he’s telling a big lie, although he’s putting the lie in the mouth of an unnamed “fellow radiologist.” This is a trick that is used often by so-called witnesses and “survivors.” The so-called informant should always be named; if they can’t name the exact source of the information, they should not be believed. At Auschwitz, he at first failed, then succeeded in becoming recognized as a doctor. He began on a work detail where he says he was “poorly dressed in the icy cold damp weather, the work meant a maximum survival of 3 months.” (We hear so often that the life expectancy was “3 months,” but why did most inmates not only live until liberation, but into old age after it? Hamburger himself is 93 years old – Feb.10, three days ago, was his birthday.) As a doctor, he supervised the cleaning of the barracks during the day, in the afternoon handed out soup, evenings he did lice control. What’s so hard about that? Yet he says that in April he developed a fever, and on May 1st managed to avoid the medical inspection (a strange story of ‘luck’) in order to be included in a transport of Hungarian “forced” laborers headed to Silesia. He says this “saved his life” (considering his 3 months were almost up, don’t you know). The train took them to Gross Rosen, where an old factory was assigned as their hospital. He says “we” had to vaccinate everyone against typhus in February 1945. Their only hope were reports of advancing Russians and Americans, which they knew of because a fellow prisoner secretly listened to the radio. At the evacuation of the camp they had to walk in the snow to the Czech Republic. From there they were taken by train from Prague to Flossenbürg camp in Bavaria. According to USHMM, Gross Rosen camp was evacuated in early February ’45 and “about 40,000” from the main camp and sub-camps had to march west. This is a lot of inoculation to be done in a few days. But more important, the 9-month period he spent at Gross Rosen between May 1944 and February 1945 is blank. May 1944 coincides with the time of the large Hungarian deportation to Auschwitz; Hamburger says he was with a Hungarian labor unit that had already been to Auschwitz and sent out from there. Would not the new arrivals also have been sent out from there in like manner? From here on, his narrative remains very sketchy, and is mostly made up of vague horror stories. He says, “The camp guards were shooting prisoners who were their live targets in the white landscape. Daily there were death sentences and prisoners were hanged before our eyes.” Yet the prisoners were needed to work in the quarries and Messerschmitt factories … and they had been innoculated in February against typhus, no doubt at some expense. So why would they be wasted as target practice for the guards? This is when survivor stories become really unbelievable. At the beginning of March 1945, he says they were deported to Ohrdruf, a work camp of Buchenwald. “Here were bombproof underground factories for assembly of V-weapons. After underground explosions with dynamite, we were to remove the big stones from the corridors by small-gauge trains.” But he doesn’t stay there. “We had to walk for four days and nights 80 km (approx. 40 miles) through the snow to Buchenwald.” Although he says he was practically “in a coma,” he’s clear about the dates and distances. 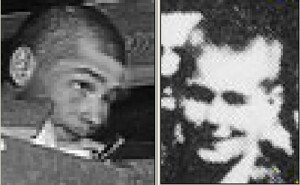 From the beginning of March to April 11, Hamburger has nothing to say except that he spent 4 days walking from Ordruf to Buchenwald and that he was in the photograph taken on April 16. He doesn’t give the date that he arrived at Buchenwald. What he tells can be picked up from any number of accounts of the time period. Can we believe he was even at Buchenwald? Why was he in that barracks #56? How long was he there? Why did “someone” have to tell him to go to the hospital 5 days after the Americans arrived? All very implausible since he was a medical professional. But beyond all this is the fact that the figure he says is him is indeed a retouched copy of the figure in the row above, 3rd from the left. He doesn’t claim any relationship to that person, who has been identified (inaccurately) by Yad Vashem Museum as Yehuda Doron or Yaakov Marton. This famous photograph has been proved to be a composite photo created by a U.S. military intelligence department to be used in the ongoing propaganda war against Germany and Hitler’s Third Reich, so everything about it is suspect. The rest of what Hamburger said in the interview does not apply to the questions I have. Again, my primary question is: When did Max Hamburger first say he was in that photograph? Like so many others, it was not at liberation, nor in the years following. In fact, there is no information that I have found as to when this did occur. Why? Because it must be recent – too recent. In 1945, Max was 25. He wrote that he and the loyal wife he married when he was 22 were divorced sometime around or after 1957, and he is now with his third wife. I bet he could sure get angry with me! I am making demands on Max Hamburger to fill in the blanks in his “holocaust survivor” story. I don’t have any reason to doubt the early part of his story but, starting with his and his mother’s arrival at Auschwitz, there is much to question. He is, from all appearances, a loyal Jew with the typical Jewish desire to avenge the “wrong” done to his people and the interruption and pain in his own personal life. Telling lies to accomplish this is not, therefore, a wrong in his eyes. A wrong for a wrong is, for Jews, a fair exchange … nothing to be ashamed of. This may even be how he counseled his patients. The man who now calls himself Naftali Prince (Fürst translates to Prince in English), and who was also known in childhood as Duro Forst, is the person circled in both photos below, taken at around the same time shortly after the Buchenwald “liberation” on April 11, 1945. 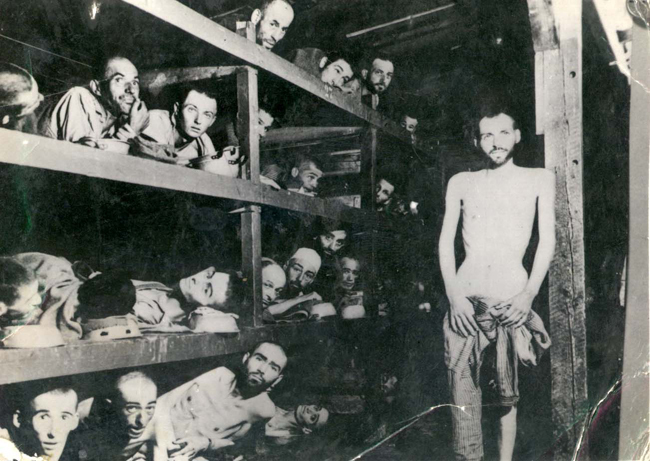 Below: “Buchenwald. 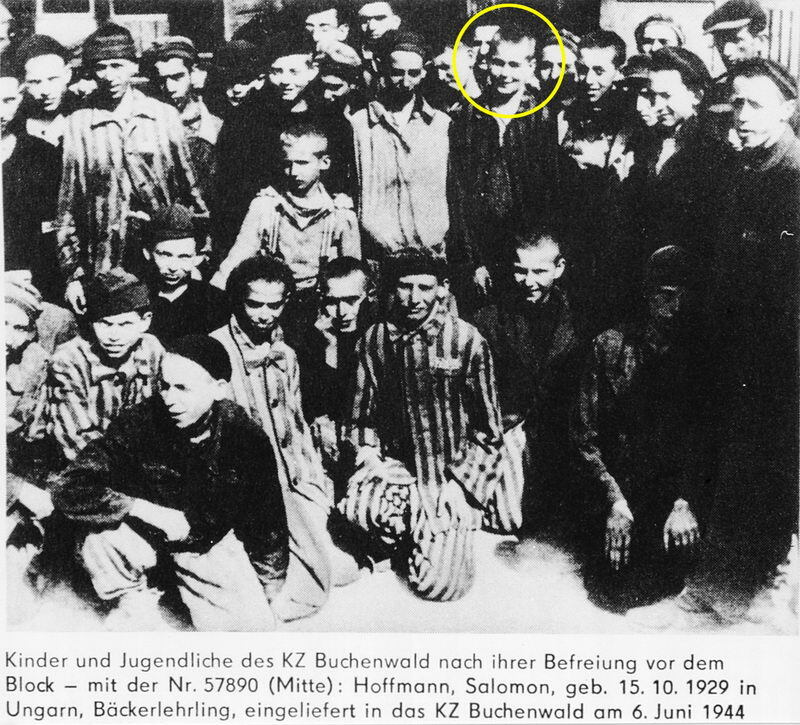 Naftali Furst is marked with a yellow circle.” Can this be a 12-year-old boy? The man two rows directly below him is identified as being 25-yrs old. 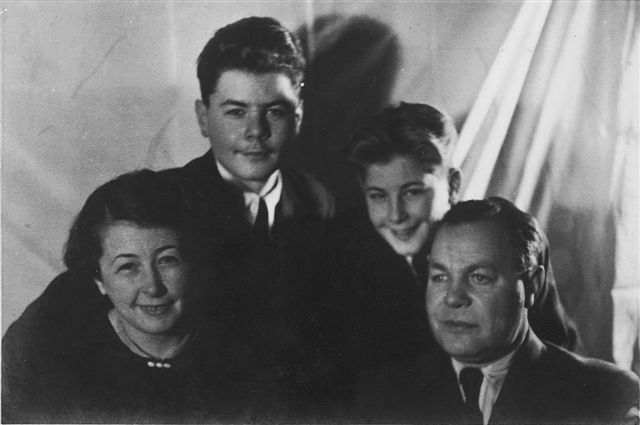 Left: “Our parents and us after the war” (As per http://furststory.com/English/YaldutMomDad.html) Naftali is to the left of his father, although he resembles his mother, while his older brother takes after their father. Why is it that he looks younger in the family photo, at age 13 or 14, than he does a year or two earlier in the barracks? Because it’s not him in the barracks, that’s why. Simply look at the difference in the forehead in the comparison of the two faces. The man in the bunk has a low hairline (short forehead). 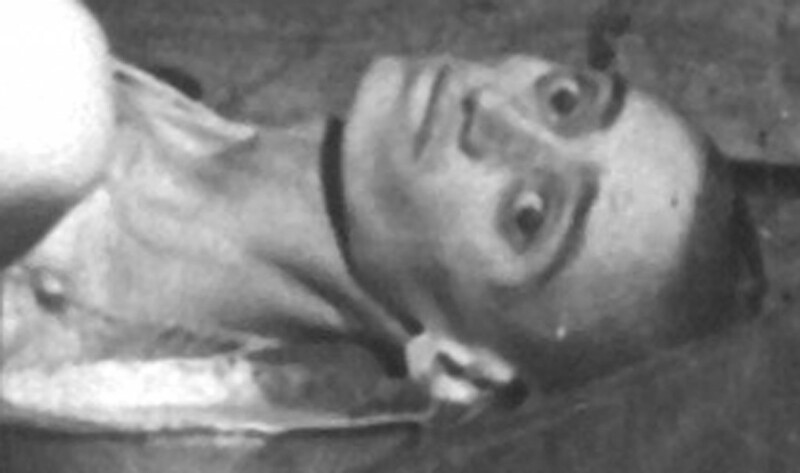 The real Naftali Fürst has a higher forehead. Thus he’s another one who succumbed to the temptation to join an exclusive club by falsely identifying himself in this famous photo. The holocaust museum people will never investigate and will never say otherwise. For over fifty years, my memories and emotions have been repressed deep in my soul. He was born in 1933; the brothers were five and seven in the fall of 1938. At the end of 1942 they moved into the Sered detention camp (photo below). … was the most acute transition in the life of our family. We left behind a big house with a housemaid and nannies and a car, and moved into a tiny room. Beyond work, cultural events such as poetry readings, as well as soccer matches, were part of the agenda. Inside the camp, there was a small swimming pool. Every now and then we were permitted to go for a swim. Among young men and women, love affairs were flourishing. The nearby hospital was an important institution. Prior to the war, there was a Jewish hospital in Bratislava. Its entire medical facilities were transferred to Sered. 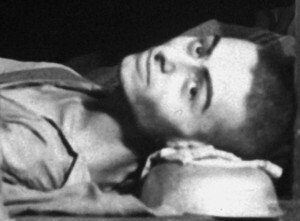 During our stay in the camp, Shmuel had an urgent appendicitis surgery in that hospital. Its proximity to the camp saved his life. By February 1944, Shmuel was thirteen years old. With great efforts and despite all obstacles, our parents managed to celebrate his Bar-Mitzvah. Dad’s number was 14024, Shmuel’s 14025, and mine 14026. After a short period, we were ordered to join with other children and youth, and move to the “Kinderblock”, the Children’s Block. Naftali was just going on 12 years old and Shmuel was going on 14. In December they were moved to an agricultural farm near Auschwitz, at which there was little work for them to do. On January 19, 1945 we were ordered to get ready for leaving the camp and a long march away. […] On the following morning, part of the farm equipment was loaded on horse-drawn wagons and the march begun: the wagons rolled in the front, while we marched behind them. During the first days of freedom, there was a lot of disorder. As we were not allowed to leave the camp, we strolled aimlessly from one barrack to another. Then we went to see the crematorium and the torture cells, and finally we opened the clothes warehouse. There we wore SS uniforms. It did not take long until we were organized into groups according to our countries of origin. Among the organizers was a man who pretended to be the brother of General Viest, a Slovak hero. He took care of the Czechoslovak group, Which a fortnight later was taken by trucks into Czechoslovakia. Upon our arrival in Bratislava, we were welcomed by the Jewish community, Which was already functioning. Nothing is said about being photographed in Block 56 and having his image immediately displayed all around the world. When did Naftali Fürst first decide he was in that photograph? I would say it would have to be after 1998, after publishing the family story he wrote with his brother that is titled “Fürst Brothers.” Did someone suggest it to him or did his photographer’s eye detect an opportunity? As with all the others, the claim of being in this photo came many years later, not until the 1980’s or 90’s, and even into the 2000’s. There is a reason for this. Where are the pictures of them from that time? And where are the records? No one in that photograph was named at the time, so it is a free-for-all now to to claim yourself to be one of those faces. After the war, Naftali studied photography in Bratislava and names his profession as Photographer. In 1949 he moved to Israel, where he still resides. 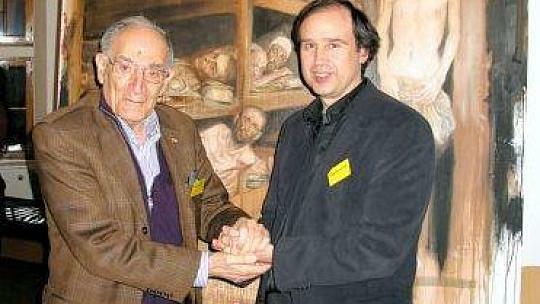 During the 7th Yad Vashem seminar of Remembrance in March 2004, Naftali Fürst told parts of his life story to a group of Austrian teachers. 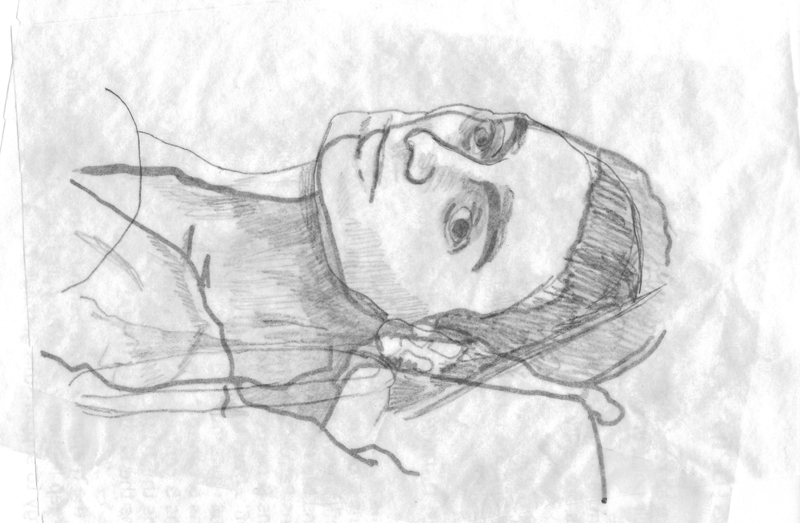 For nearly an hour he revealed fragments of his memories. 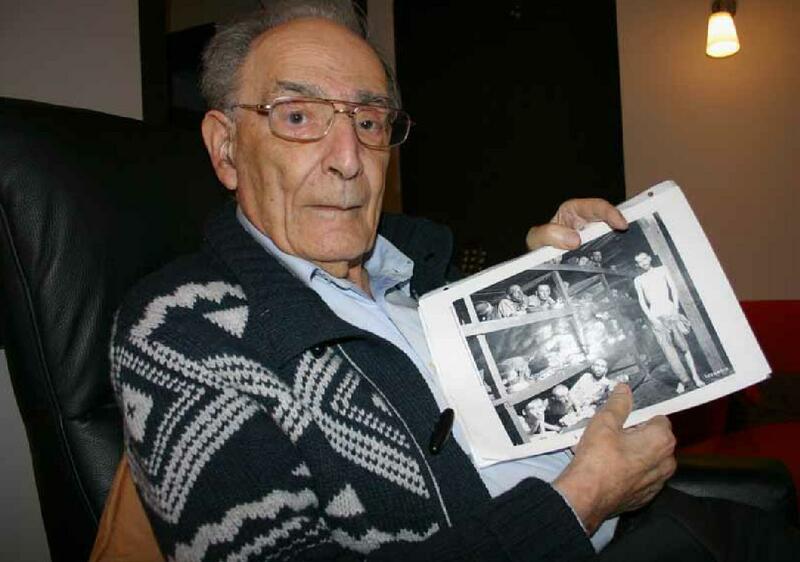 Even though they all say they are in that picture taken on April 16, 1945, and Grüner and Fürst both say they stayed in the children’s Block #66, they did not know each other. 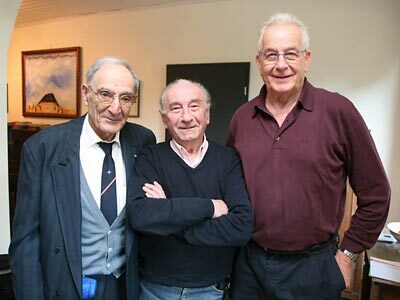 The three men met for the first time when the now deceased journalist Ursula Junk brought them together on the 60th Anniversary of the liberation of Buchenwald in 2005. On the occasion of the commemoration of Kristallnacht on November 9, 2006, they met again in Germany at the home of the artist Christiane Rohleder, in Much near Bonn. Invited by the Archivist of the Rhein-Sieg-Kries, Dr. Claudia Arndt, they each told the story of the 1945 photograph to the students — three painful biographies. If you believe it.